Weekends call for delicious grilled meats, veggies and the best side dishes E-V-E-R. Like this Bacon Parmesan Pasta Salad. 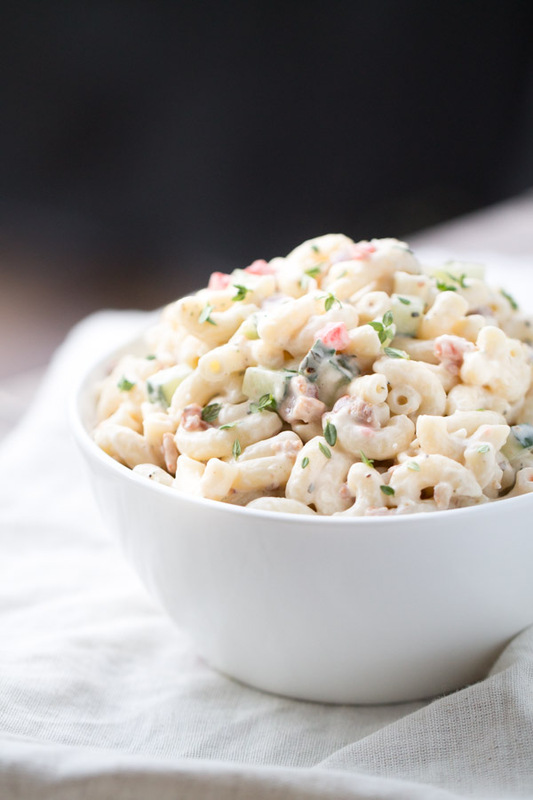 Creamy mayo, grated parmesan cheese, pimentos, seasonings and BACON meet macaroni noodles in this knock your socks off pasta salad. It’s so super easy to make. Just throw all of the ingredients into a mixing bowl and mix until well blended. Garnish with fresh thyme for an extra boost of flavor. Save for dinner or stuff your face immediately. I may or may not have snuck a few spoonfuls from the bowl before dinner was served. Because taste testing and all, right? We are grill fanatics at my house. I love prepping food for the grill. Ken loves grilling it. We both love stuffing our faces with it. We love stuffing our faces with tasty side dishes, too. I almost always make a pasta side dish. Sometimes macaroni and cheese. Sometimes pasta salad. 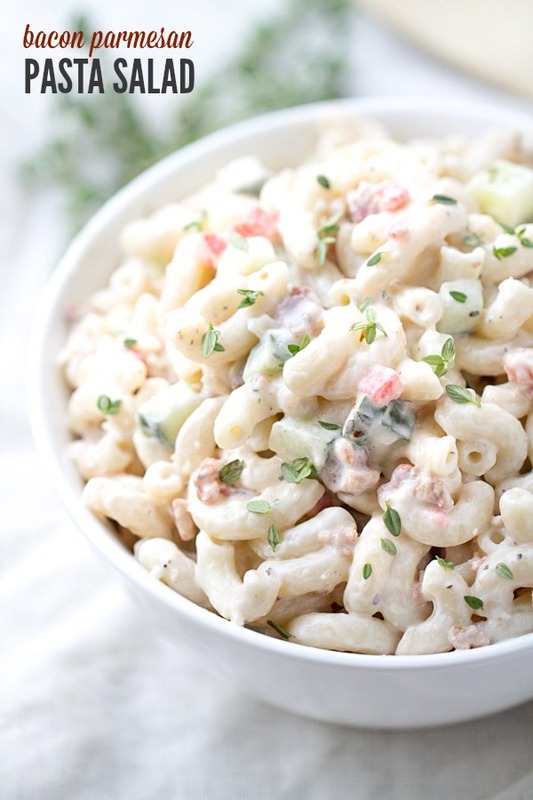 Pasta salad usually wins during the summer months. Because let’s face it. 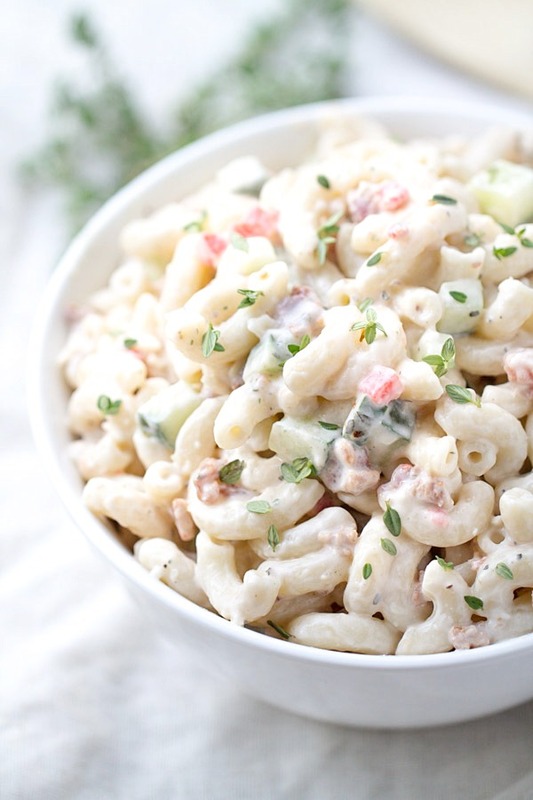 Pasta salad is cool and refreshing, which pairs well with dreadfully hot weather. On this particular hot summer evening, Bacon Parmesan Pasta Salad won. Enjoy the recipe! 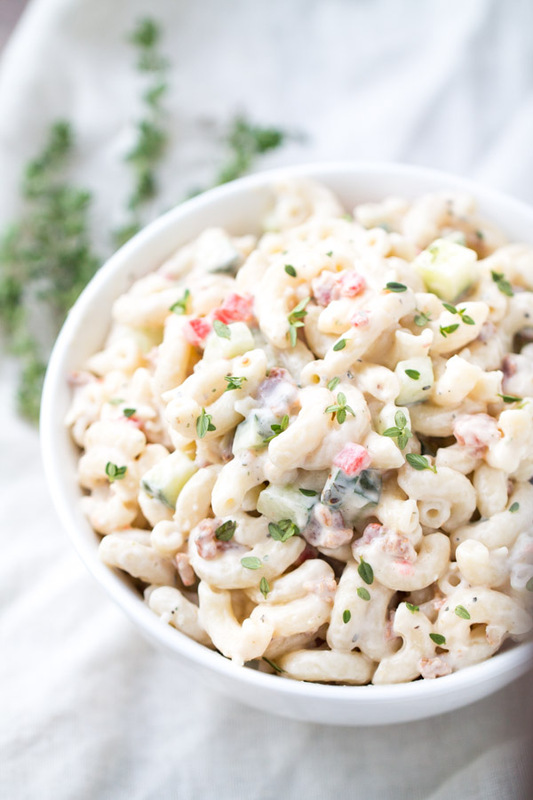 Creamy mayo, grated parmesan cheese, pimentos, seasonings and BACON meet macaroni noodles in this knock your socks off pasta salad. It's so super easy to make. Just throw all of the ingredients into a mixing bowl and mix until well blended. Garnish with fresh thyme for an extra boost of flavor. Cook the macaroni according to package directions. Remove from the stovetop and allow to cool. Once the macaroni is cooled, place it in a bowl and add the remaining ingredients, minus the salt. Do a taste test and add salt, if desired. A few recipes from around the web. Green Goddess Pasta Salad from Call Me PMc. 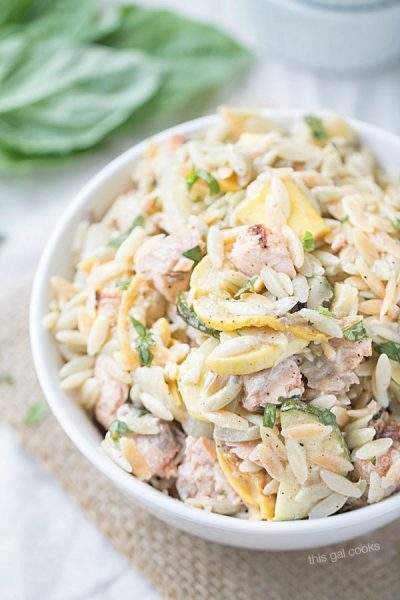 Easy Summer Pasta Salad from Two Peas & Their Pod. 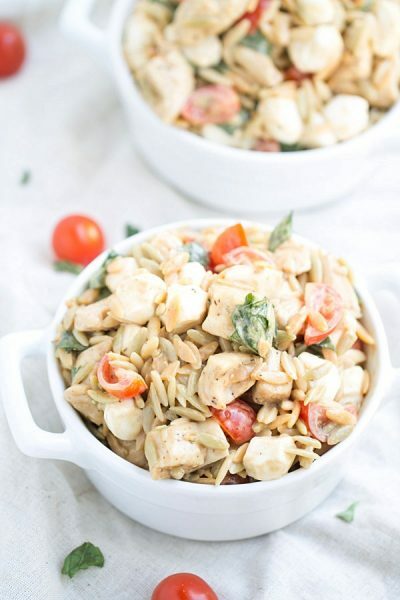 5 Ingredient Strawberry Caprese Pasta Salad from Gimme Some Oven. Kinda want to lick my computer screen it looks that delicious! Thank you, Annie! We got behind it too…and devoured all of it! You can’t go wrong with bacon and pasta- this sounds creamy and delicious! You’re welcome, Joanne! I hope you enjoy the pasta salad! Hope you have a great weekend, Kelly! Ahhhhh so creamy!! My kind of pasta salad! So many great salad recipes. Thank you. Is there a SAVE button ?? am I missing something…. help please. Thank You so much for the info, !